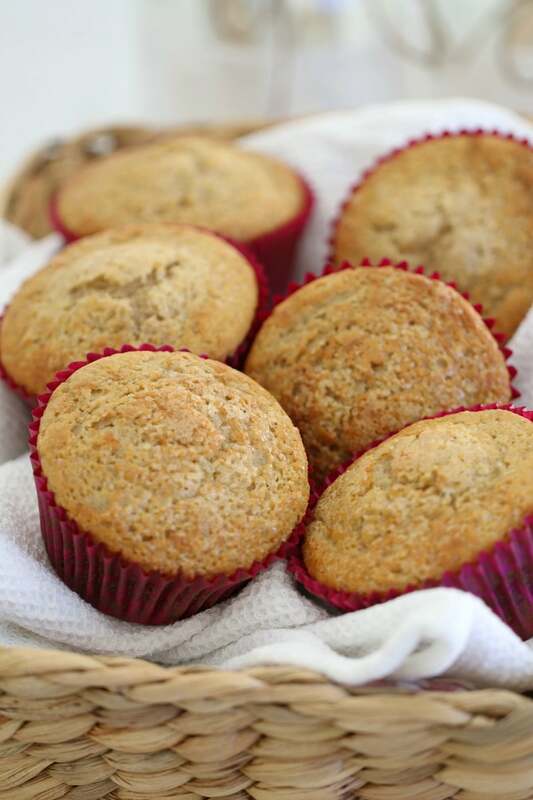 These Easy Banana Muffins pretty much sum up what the Bake Play Smile website is all about. Quick, easy and yummy recipes. There’s nothing too flashy or complicated here (I wish I was that clever! ), just good old fashioned favourites that everyone loves. 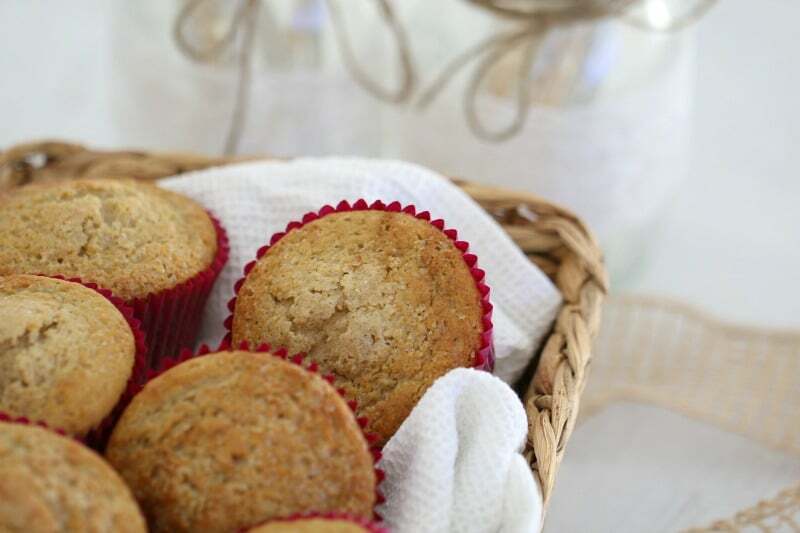 Banana muffins are pretty much a staple in our house. They make the best little snacks when you’re ‘on-the-go’ (and I ‘may’ have been known to consider them a perfectly acceptable breakfast food from time to time). 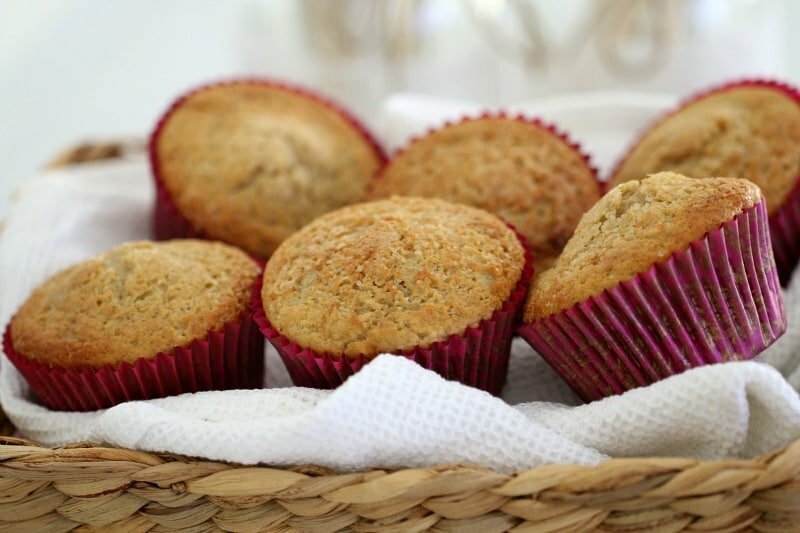 My favourite thing about these easy banana muffins (apart from the fact that they really are so easy), is that they’re entirely made from pantry/fridge staples. There are absolutely no fancy ingredients involved. Just the basics. They’re also a fab way to use up any ripe bananas you have lying around (and the riper the better!). Ooh actually if you’re after another yummy recipe for bananas, check out my Rich & Fudgy Double Chocolate Banana Loaf. Errrmmeeeegoddd!! It’s perhaps not the healthiest thing in the world, but it is SO worth it! 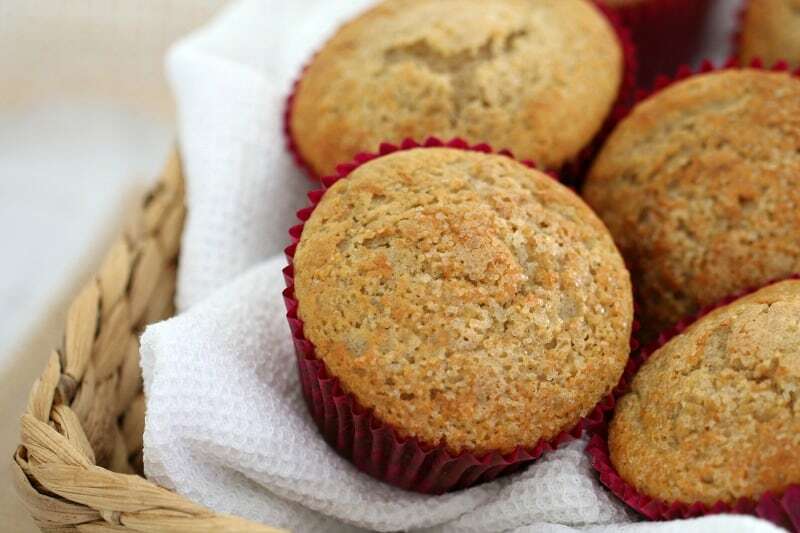 To make these muffins even better, I like to sprinkle a little bit of raw sugar over the top just before cooking. This just gives them a really delicious crunch once they’re cooked. You definitely don’t ‘have’ to do that… but I’d highly recommend it! 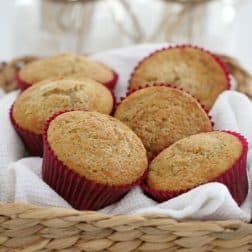 Also, the actual muffins aren’t ridiculously sweet, so it adds a yummy flavour. 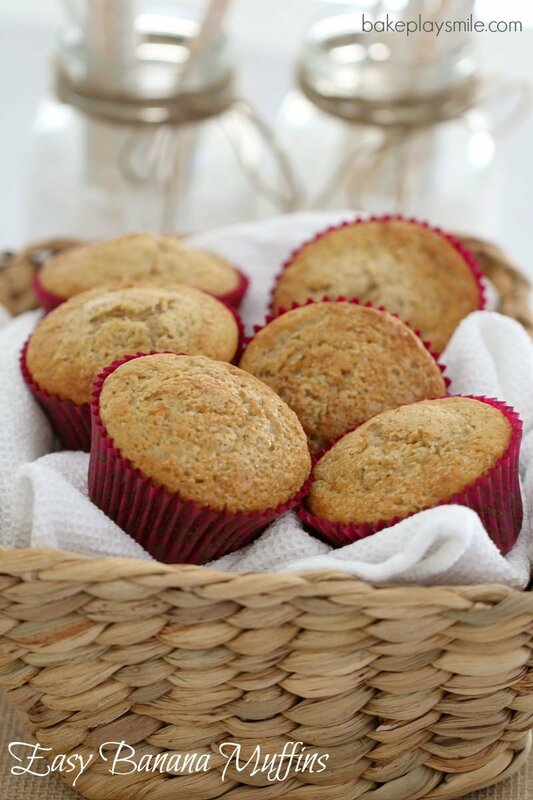 Hmmm… what else to tell you about these easy banana muffins? Well they’ll only take you 10 minutes to prepare AND you don’t even need to get out your beaters. A good old fashioned whisk and wooden spoon will do the trick.. which is just fab. Preheat oven to 190 degrees (180 if using fan-forced). Line a 12 hole muffin tray with muffin liners. Place bananas into a bowl and mash well. Set aside. Melt the butter in a microwave-safe bowl for 30-60 seconds or until melted. Allow to cool slightly. Add the vanilla extract, honey and milk and whisk together until well combined. Add the eggs one at a time and whisk between each addition. Add the mashed bananas and beat for a further 20 seconds or until well combined. Sift the self-raising flour, caster sugar, baking powder, bi-carb soda, cinnamon and salt into a bowl and stir together with a wooden spoon. Make a well in the centre of the dry ingredients. Pour the liquid into the prepared well and mix gently (do not over-mix). Divide mixture evenly between the muffin cases. Sprinkle with the raw sugar (optional). Cook for 15 minutes or until they spring back when lightly touched in the middle. Allow to cool in the tray for 5 minutes before transferring to a wire rack to cool completely. Place bananas into the TM bowl. Mash on Speed 8 for 10 seconds. Pour into a bowl and set aside. Place the butter into the TM bowl (don't worry about cleaning it) and melt on 100 degrees, 60 seconds, Speed 3. Scrape down the sides and melt for a further 30 seconds, 100 degrees, Speed 3 (if needed). Add the vanilla extract, honey and milk and mix together on Speed 6 for 20 seconds. With the blades spinning on Speed 3, add the eggs one at a time through the MC hole. Add the mashed bananas and mix for a further 20 seconds or until well combined. Add the self-raising flour, caster sugar, baking powder, bi-carb soda, cinnamon and salt and mix for 5 seconds on Speed 4 (use the spatula to help mix). Add the chocolate chips and mix on Reverse Speed 4 for 5-10 seconds or until just combined. 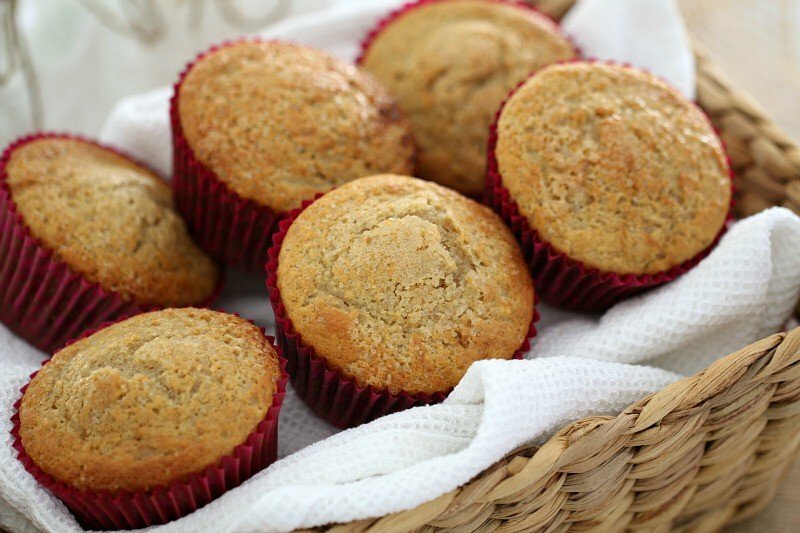 I made banana muffins the other day – totally legit breakfast food! These look so yummy! 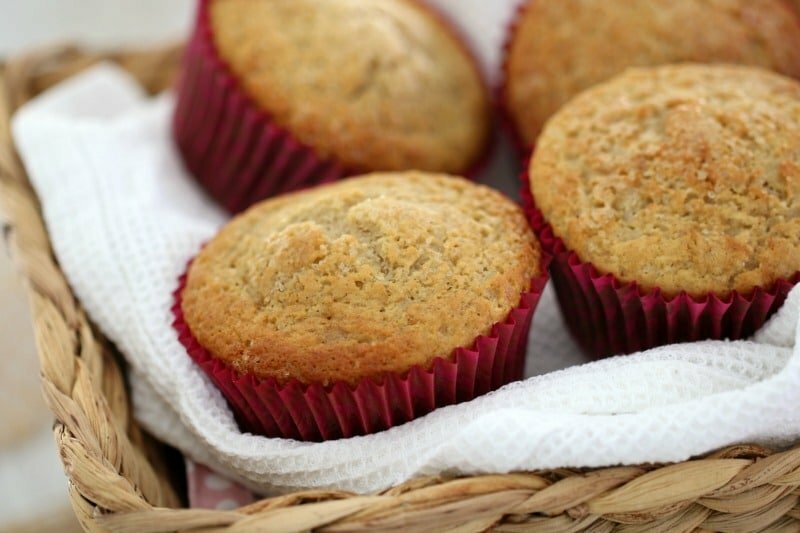 These are the lightest, fluffiest muffins ever! Demolished as an after school treat!